Do you know the Florida Rd UIP hotline number, or what’s on the First Thursdays line-up? What about the best place to go for late night dining or where to get your nails done? For all these answers and more, get the FREE Florida Rd area APP. Scan the code below or search Florida Rd in your APP store. Responding to the times we live in and the need to have information, literally, at our fingertips, Florida Rd has developed a unique area-based APP free to download from all APP stores. 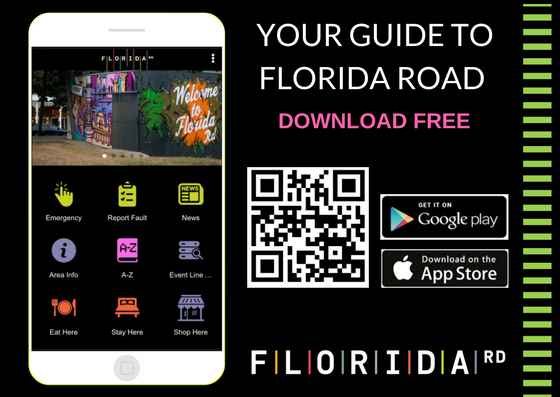 The APP have been developed to enhance the experience of Florida Rd for visitors, businesses, residents and tourists, by providing a single ‘go-to’ point for all local information. Comprehensive and user-friendly, the APP groups similar content together making it easier for people to access the exact information they need. From a comprehensive A-Z, to where to eat, shop and stay in each place, every business located in that area is listed with a click- to-call phone number. Local knowledge from fishing regulation and where to hire umbrellas, to what time the public clinic opens, and when the local library hosts kids’ reading hour, is contained in the Area Info section, which is constantly refined and updated. In terms of safety, the APP lists the hotline number for the UIP on site and available 24/7. In addition to this, the APP allows you to Report A Fault, by capturing an image and sending an alert for everything from street lights out, to lost pets, directly to the UIP teams. The events section of the APP gives you line up of activities in each area, as well as the option of checking out what is happening in the whole of Durban. Understanding that these nodes are part of a great City and provincial offering, the APP has a More Durbs section, which, again via a categorized listing gives the user info on everything from Township Tours to Local Markets and everything in between.